With every job comes the demand to learn how to do certain things well. When it comes to being a student pastor there are a few things I believe you must learn to do well. I’m still pretty new to full-time student ministry myself, but I’m learning a ton of stuff along the way. Here are four things I am learning that I believe myself and other student pastors must learn to do well. Teach well. I believe the most important thing students pastors must be good at is teaching God’s Word. Student pastors can build a program, plan great events, and build great relationships with students, but if they cannot teach the Bible effectively to students they will struggle. I’m not suggesting that they must be able to stand on stage and give the perfect expostional sermon, but they must know how to take the truths of God’s Word and teach them in a way that applies to the current culture of today’s teenagers. Students pastors must learn to teach the Bible well on stage to a large group of students as well as within one on one relationships with students. Student pastors must always be striving to be better teachers of God’s Word. Work with people well. Ministry is about people and student ministry isn’t any different. Student pastors must learn to work well with all types of people. First, they must work well with the church staff. Nothing is worse than a young student pastor who thinks he knows how to run the church better than the rest of the staff. Student pastors must learn how to work well within the whole church staff. Second, they must work well with parents. Student pastors not only minister and serve students, but their parents as well. Third, they must work well with volunteers. A student ministry cannot be effectively ran by just the student pastor, it takes a team of volunteers. The student pastor must learn how to work well with these volunteers. Learning how to work well with people is very important in student ministry. Program well. Don’t get me wrong, I know student ministry is much more than building a creative and attractive program, but that program is an important part. Student pastors must learn how to be good programmers. That means programming the mid-week or weekend services well, retreats well, events well, and other things we do in our student ministries. I know some student pastors are all about relationships and that’s great! Relationships are key to effective student ministry, but you cannot sacrifice building an effective program for the sake of only building relationships. Student pastors must learn how to program their student ministry well. Study teen culture well. I hesitated throwing this last one in, but I believe it’s something student pastors must do well. To be a good missionary you must study the culture your going into. The church doesn’t just send missionaries into foreign mission fields without giving them time to learn the culture. It’s the same with student ministry, student pastors must see themselves as missionaries to students who have their own subculture. Therefore, student pastors must learn to study that culture well. How will a student pastor effective teach Biblical truth if they don’t know the culture they are applying it to? How can they build a relevant program if they don’t know what attracts and connects with teen culture? Student pastors must learn to study teen culture well. Studying teen culture isn’t hard, it just takes time. Click here to see a list of helpful tools I use to learn more about teen culture. I know there are many things student pastors must learn to do well, but these are the ones I have been thinking a lot about recently. I would love to hear from you on this subject. 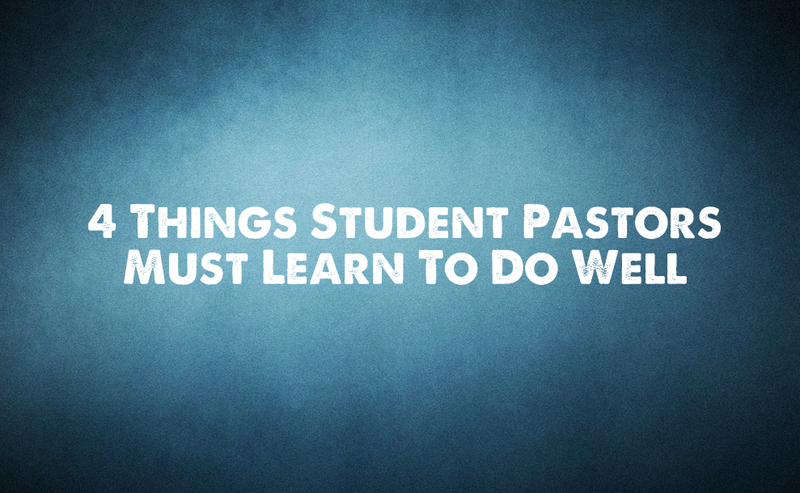 What do you think are the most important things student pastors must learn to do well? Feel free to leave your thoughts in the comment section below.